Dr. Arlene King – Was the H1N1 Flu Pre-planned? Editor: Trust this woman at your own Risk! 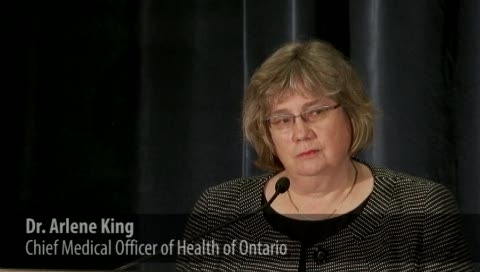 Notice she is not with Health Canada. Presentations and discussions held during the meeting served to review activities contributing to the implementation of the GAP. Major progress has been made by the vaccine industry in developing H5N1 vaccine formulations, which will allow substantial antigen sparing in case of a pandemic. Indeed, three multinationals have shown appropriate immunogenicity of vaccine candidates containing as little as 3.8 to 7.5 ug HA, formulated with proprietary adjuvants. characterized by several concurring issues: a) development of creative financial strategies; b) building a strong marketing campaign; c) relying on lessons learned from previous vaccine-preventable disease control, elimination, or eradication campaigns, i.e. polio; and d) incorporating lateral thinking to leverage sister UN organizations and partners such as the United Nations Children’s Fund (UNICEF), the Global Alliance for Vaccines and Immunization (GAVI) and others. In particular, GAVI should be approached as a source of financial assistance. In addition, the establishment of a financing mechanism such as the Pan American Health Organization (PAHO) Revolving Fund should be explored as a solution to reduce seasonal influenza vaccine prices. 2) The GAP business plan provides a global framework for increasing vaccine production capacity for influenza vaccines. Implementation of the GAP should also result in strengthening of surveillance, as well as providing an opportunity for improving the performance of national immunization programmes. Indeed, it may improve the world’s ability to conduct mass vaccination campaigns and represents an opportunity to strengthen vaccine regulatory systems. and WHO is working with partners (UNICEF) and donors to mitigate this risk. The Advisory Group appreciated that the business plan was developed by independent consultants following discussions with country representatives and other stakeholders to achieve buy-in by the international community, and to prevent the GAP from being considered a bureaucrat-driven solution. From a marketing and financial perspective, the right engine to achieve this plan has to be selected based on a financial perspective. It will be critical to choose the right channel, which may include hosting the GAP under the umbrella of the implementation of international health regulations, as a global health security issue, or under health system strengthening. The business plan should work towards alignment with other organizations, harmonization of strategies with donors and maintenance of commitment of stakeholders/donors to avoid donor fatigue. 1) The main priorities for WHO for the year 2008 should be to choose the appropriate spin to be placed on the business plan in association with the right marketing strategy. WHO also needs to establish a detailed operational plan and to define financial resources i.e. donors, countries, and other stakeholders. Leveraging the GAP with twin programmes from sister agencies or other stakeholders, as well as making sure that the need for increasing influenza vaccine production capacity is addressed in the political arena are key priorities. – Maintaining global commitment through information, communication, and educational activities. – Addressing any potential liability issues associated with the business plan. The Canadian govt. has shielded the manufacturers from liability in the case of side affects or death from the vaccine. Why? It certainly looks like a scam folks! Before you take the vaccine do your own research. This entry was posted in H1N1, health and tagged chief medical officer of health ontario, Dr.Arlene King, H1N1 swine flu vaccine, Health Canada, pandemic, Truth about the H1N1 vaccine, vaccination centers. Bookmark the permalink.